Hello, lovelies! Hope you’re having a great day. I know I am! Last night was fantastic, I still have a tough time believing what happened. It was simply wonderful! There, have I piqued your interest yet? Do I have your attention?? I do? Okay. NO NO NO. THAT’S NOT IT. I’m sorry I came across that gif and just had to use it. Guess you could say I’m feeling Marvel-ous. My bad. It’s just that I am high on a special something. No, not on drugs. Whatever gave you that idea anyway? Seriously who do you think I am? Don’t answer that. By now there can only be two types of response to my humor. OKAY. The point of this post (yes there is one) is to let you know that thanks to a generous someone, I am going to make five of you lovely people very happy. More specifically: five bookworms. Back to what’s got me so happy. Some of you already know how much I love Matt from Anya and the Shy Guy by Suze Winegardner. If you don’t know, then check out my review of the book here. Due to the overwhelming response I got from you fangirls out there, I figured lots of you already love Matt (even if you haven’t read the book). Initially, I planned to write up a post about Matt, so we can all fangirl and swoon over him together. I was looking for a celebrity to picture him as and to add to the post but I just couldn’t. Then, I thought “Who could be better at visualizing him than the author?”. Flash forward and not only did I have a really hot guy as Matt, the author went the extra mile and is sending me a mini swag pack and offered to help me out with a giveaway. YES, a giveaway for YOU. There are two sides to each bookmark. 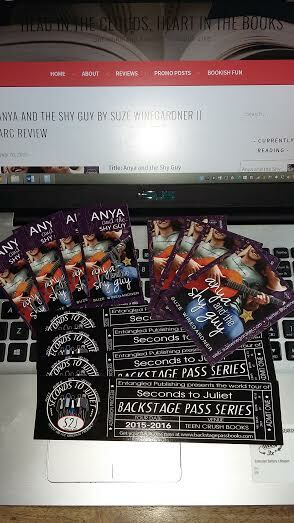 One side is the cover and blurb of Anya and the Shy Guy; the other is the Seconds to Juliet concert tickect design. There will be a total of FIVE winners. EACH winner will win a SIGNED BOOKMARK and a SIGNED FRIDGE MAGNET- courtesy of the author. INTERNATIONAL. But I guess we don’t have to worry about that anymore, because what you are going to do is read the book and convince me that YOU should be one of the lucky five winners. Also, please don’t use sentences like, “I should be the winner of this giveaway because…” or “I think I should win because…”. THAT’S NOT YOU! Be yourself, keep it real; fangirl, caps lock entire sentences, have typos in your sentences because your head and fingers aren’t really working together. You will do the convincing/fangirling in the comments of the post dedicated to Matt. Which means… If all goes well and I post it next Sunday, you have approximately one week to read the book and the giveaway will be open from then until I get all five winners. Hello lovelies! Hope you’re having a great weekend. This post has been long due and I’m glad I’ve finally gotten around to it. 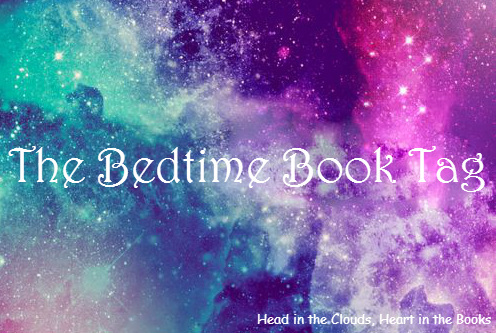 So, Poulami @ Daydreaming Books and I are hosting a Daughter of Smoke and Bone Blog Buddy Read/ Read Along. This will be my very first time hosting one, so naturally I am super excited and I hope it goes well. It’s hosted by me and Poulami @ Daydreaming Books. It will begin on the 15th of July and end on the 31st of July. It is open to everyone to join, the more the merrier! Feel free to post updates on your respective blogs, Goodreads, Twitter and other social media. Use the hashtag #Smoke&BoneReadAlong so we can all find each other’s posts. At the beginning of August we will all come together to discuss the book (I hope we get some major fangirling there) and then move on to writing our respective reviews.